Cairo Airport is owned and manaed by Cairo Airport Authority. The passenger terminal complex at Cairo International Airport consists of three passenger terminals - T1, T2 and T3, as well as a Seasonal / Hajj Terminal. Terminals T1 & T2/T3 are 3 km apart. The automated people mover, with the main station between T2/T3, connects on a 1.8 km track Terminal 1, the Air Mall, the multi-story carpark & Terminals T2/T3. - a 10-minute ride. Shuttle buses also connect the terminals. Bars are available in the departure halls of T2 & T3, open 24/7; paid WiFi is available throughout most of the terminal areas. An automated people mover transports passengers from T1 to T3 within 10 minutes. Terminal 1 is host to all non-Star alliance airlines. For flight information, contact your airline or call 090077777 (landline) or 2777 (mobile). The ground level of T1 is divided into Arrivals & Departures. (a) The Arrivals section has banks, passport & Immigration, duty-free shop, Customs Area, baggage claim area (also connected to departures area), Arrivals Hall 1, and common area with cafeteria, Meeters hall , Information & bank counters. (b) The Departures section houses check-in counters, Departures Hall 1 with connection to Departures Hall 2. Level 2 of Terminal 1 houses the Departures Hall with check-in counters, Immigration and access to Transit area. , & Immigration & security check leading to Transit Area, with acces to gates 1 to 12. Terminal 3 opened in 2009 and is home to EgyptAir (domestic & international) and currently all Star Alliance members. With two concourses and a capacity of 11 million passengers a year, it is equipped with state-of-the-art technology, including biometric border control, T3 offers self-service kiosks, biometric immigration kiosks, & fully-automated baggage handling system with integrated online screening. Aside of the information desks located throughout the terminal, it also sports a 4000 sq.meter retail space. - International Arrivals gates on level 2 are presently paired as gates F1/F21 to T9-F29 and G1/G21 to G9/G29. 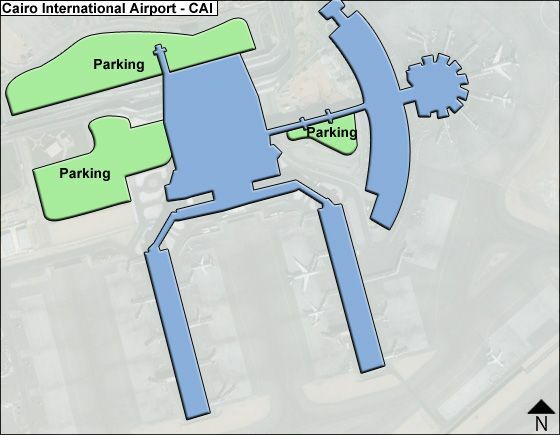 - International Departures gates are F1-F10 at left and G1-T9 at right, with gates H1-HS near the center. These areas have some duty-free shops. NOTE: The new Le Meridien Cairo airport hotel is linked to T3 by pedestrian bridge. A new museum containing 39 pieces of Pharaonic, Coptic & Islamic eras - are presently on loan from the Egyptian Museum in central Cairo. Current amenities & services at both T1 & T3 include: baggage trolleys & porters; left-luggage and (a) At their Departures Hall & transit area a good number of restaurants, cafes & fast-food; shops & duty-frees, book stores & news stands; and (b) At their Arrivals level numerous tour operators & travel agencies, rental car counters for Avis, Budget, Europcar, Hertz & Sixt and pharmacies & first-aid stations. The Tourist police inside the terminals also provides information (tel. +20 2 2265). Lost & Found is at T1 (tel. +20 2 2265 5246) . Special Services include Lounges (VIP Lounge, English Lounge, Italian Lounge, American Lounge, and Egyptian Lounge). The Airport offers three levels of Exclusive Services: Meet & Assist, Exclusive Service & Exclusive Service Royal Lounge. For more information call 16708 or +20 2 2265 5647/ 3120, 3160 or 3215, or e-mail: [email protected] You can also book directly at special counters or in the Exclusive Service Building next to T1. The new Seasonal / HajjTerminal able to handle 3.5 million passengers accommodates all of Egypt Air's seasonal and Jeddah / Medinah flights. The terminal can handle 1,200 passengers an hour, and offers over 1,000 seats in the gate areas.